Poseidon was above all, the God of the Sea, who was capable of calming the waves or of summoning up terrible storms and so taking the lives of those who displayed disrespect for him. One of the twelve Olympic Gods, he was brother of the mighty Zeus and son of Cronus and Rhea. Poseidon helped Zeus in the Battle of the Titans and received his famous trident, which became his symbol from the Cyclopes. He also contributed to the victory of the Gods in the Battle of the Giants. Zeus, Poseidon and Hades shared out power over the cosmos. Zeus was given the sky, Poseidon the sea, and Hades the underworld. He was usually depicted voyaging across the waves in his golden chariot, drawen by monstrous animals, hald horse and half serpent, surrounded by dolphins, nereids, and the other creatures of the deep. 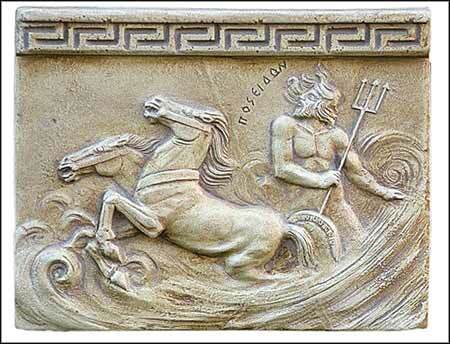 Poseidon was the progenitor of many mythical heroes such as Proteus, Orion, Theseus, etc.